Given a Binary Tree, print Left view of it. Left view of a Binary Tree is set of nodes visible when tree is visited from Left side. The task is to complete the function leftView(), which accepts root of the tree as argument. The first line of input contains T, denoting the number of testcases. Each testcase contains two lines. The first line contains number of edges in binary tree. The second line contains number of edges+1 number of nodes data. The function should print nodes in left view of Binary Tree. Since this is a functional problem you don't have to worry about input, you just have to complete the function leftView(). 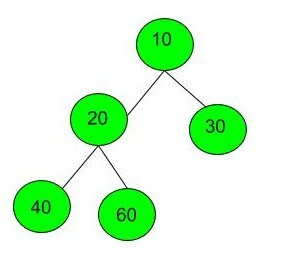 Testcase 2: below is a given tree with its nodes. We can clearly see that nodes which are at left view of tree they are 10 20 40.